The advancing demand of mobile and the increasing use of internet on mobile have now slowly changed the way of SEO. Now, Google is focusing more to offer direct answers to the search queries. Here are some important things that digital marketers, SEO info diggers must know about these major SEO Changes. During recent years, the science of SEO has completely transformed with Google updates especially the latest mobile update. Now, as mobile, voice also is important. Future SEO professionals must be prepared to analyze the search results based on voice search. Beginners and SEO practitioners must focus on the type of queries generated via voice search and also identify whether the voice search is performed from mobile device or from laptop or desktop. And at times, Google will satisfy the query by providing direct results. 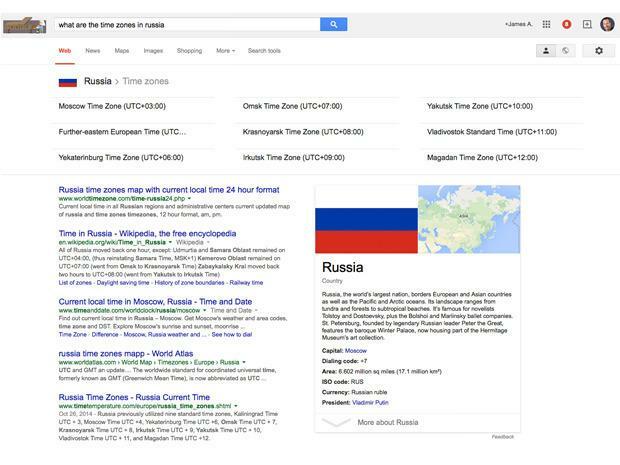 Here, we can see that for a search query “Time Zones in Russia”, a table of country’s time zones was displayed by Google among top search results. In such cases, direct queries fulfill the purpose and reduce the effort of clicking on various links for results. Like this for several search queries, Google has now started providing direct answers so as to enhance the user experience. Google analyzed that clicking on several links to get the answers took lot of time and hence they came up with the new technique of providing direct answers. So, even if you are searching via voice search; you are likely to get direct answers for your search queries. This new technique of voice search and direct answers have included the need to add more structured data to sites and offer clear answers to some specific questions in online content. As per the recent search query analysis, Google had given direct answers 19.5 percent of times. Before two years, Google used to give direct answers to only 4% of search queries and comparing Google with Bing, Bing offers direct answers to only 1.1% of search queries. But slowly, Google increases its responses via direct answers instead of providing links because usually voice searches are carried out on mobile devices and mobile users wish to have quick answers on their screens. However for some queries, you can see tabbed results instead of the ones displayed in table for some certain queries. How marketers can make best use of these direct answers? Voice search and direct answers have several changes on websites that website publishers and digital marketers must keep in mind. From 8, 50,000 search queries, Google offered direct answers to 42,160 queries. Further, these direct answers are provided with search queries done in natural language say voice search or text search from various online resources. Websites that are often selected in search results and get high ranks on regular basis are very often considered to be authoritative. Hence, those websites that Google has selected to give direct answers can be highly benefitted as they will get sufficient exposure. Such sites can be considered as authoritative resources. Content that is selected to provide direct answers is also displayed differently in various search results. This will help the website to get more traffic to a website especially when direct answers by Google fail to answer the search query properly. Hence, content marketers and SEO experts must directly focus on specific questions, their answers and then make sure that the website perfectly answers those questions. Hope this helps the digital marketers as well as website owners to properly frame an SEO strategy that actually qualifies the website to be included among direct answers by Google. Framing SEO strategy as per the trends is somewhat a complex task that only experts can handle. To get in touch with such experts get connected with Platinum SEO; provider of affordable SEO Packages in Melbourne.